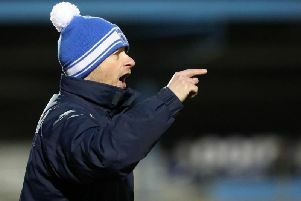 The sense of relief at The Showgrounds on Saturday was palpable as Coleraine secured their first win under Rodney McAree. With four draws and a defeat in the five fixtures since McAree took over the Bannsiders hot seat it was fair to say there was a bit of tension about the place. Gareth McConaghie celebrates his goal. But McAree could see an improvement is his new side week-on-week, and felt a win was not far away. Saturday’s victory over Crusaders won’t go down as a classic, but that won’t bother McAree, or the Coleraine players and fans. “It’s great because everyone has been talking about it, and it’s the only thing people have been wanting to talk about,” said the Coleraine boss after the game. “I don’t look for excuses, but people don’t want to give you an excuse of players being injured or suspended, and being down to the bare bones. “But when I looked at the results so far we drew here with Linfield, we could have beat them; we drew at home against Ballymena with ten men after only 14 minutes, that wasn’t a bad result;we had a poor result away at Newry, we should be doing better there, and we shouldn’t be getting beat at home the way we did to Glenavon. “Today’s result has taken a bit of pressure off the players. “I thought we were decent last week in Wales. The conditions were very difficult and we were down in numbers. “I’ve saw a major improvement in training in terms of the players application, and I knew we were going to get a performance today, you just worry if it was going to be enough. “It was fantastic see see ‘Big G’ pop up with the winner and to see it hit the back of the net. “When you look at the back four they defended marvellously and the two centre halves were exceptional. “And Chris Johns makes a save with three minutes to go which was absolutely top drawer. “I’m sure he’ll turn round and say that’s his job and that’s what he’s there for, but he did it ever so well. “At one stage I thought we maybe could have gone up the pitch and scored a second, but it’s difficult when you’ve come off a run of draws and the defeat against Glenavon. “It’s difficult to have that confidence and belief to go and do that. For Crusaders it was a fifth league defeat of the season. But boss Stephen Baxter felt his side deserved more from the game. “I’m actually very disappointed we didn’t win the game,” said the Crues boss. “If we had of scored in the first-half, then we would have got the momentum and a strong hold on the game. “We really came here to win the game, not to sit back and fine margins were the difference. “If we had of won 1-0, you’d be saying ‘unlucky Coleraine’ so it is what it is and you battle for another day. “There was very little in the game. We were the better team in the first 30 minutes of the first-half and they got the better of things 15 minutes before half-time. “It was a scrappy affair in the second-half and the manner of the goal is disappointing as we don’t think it was a free-kick. “We will have to watch it back and break it down and we got one disallowed at that end, Cushley had a great effort saved and it all comes down to fine margins. Crusaders confirmed after the game they have lodged an appeal over Sean Ward’s first booking in last week’s 3-0 win over Glentoran.